Phoenix BikeFest is taking over the Westgate Entertainment District in Glendale to kickoff the 3rd Annual Phoenix BikeFest rally. 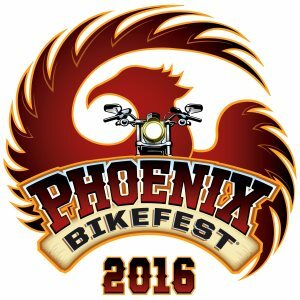 Phoenix BikeFest will run from Thursday, April 7th – Sunday, April 10th. This year Phoenix Bikefest will take up two areas at Westgate. There will be an all new and improved lineup of activities including; factory demo rides, live bands, bike show, fashion show, rows and rows of industry-related vendors, and more. We’ve added more food and beer vendors this year to the event as well as more shade and areas to relax. The Demo Area will feature rides from manufacturers including Harley-Davidson, Indian Motorcycle, Victory Motorcycle and more. This will be a one stop shop for you to test ride many different models of motorcycles to help decide which is best for you. There will also be a huge tent featuring a large selection of new and pre-owned bikes for sale. The area south of the Demos will feature the Vendor Midway, an interactive marketplace with everything you need to fulfill your motorcycle riding needs, no matter what your riding style. Industry experts will be on hand and ready to go over your options for maximum comfort, confidence, and performance. If you would like to be a vendor at Phoenix BikeFest, call 480-755-5398 or email info@phoenixbikefest.com. Space is limited. Last but certainly not least, back by popular demand will be the Phoenix BikeFest Ride Through Experience, the center piece of the Vendor Midway. Entering the venue you will travel directly through the Ride Through Experience where you will be greeted by live music and fellow riders leaning on the rails cheering you through. The Ride Through Experience will feature entertainment and your favorite beverage to cool you down while you watch the parade of bikes roll through while listening to your favorite tunes. For more information go to www.phoenixbikefest.com. Like us on Facebook at www.facebook.com/phoenixbikefest to stay up to date on all the new announcements. Tell your friends and we’ll see you at Phoenix BikeFest!